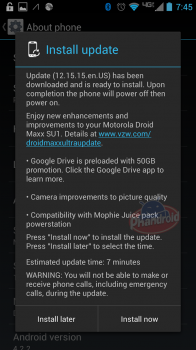 Last week, we learned about an OTA upgrade — version 12.15.15.en.US –going out to Motorola’s latest DROID phones for Verizon. The updates first came as part of a soak test, but it was later discovered that some folks had gotten the green light to download it without being part of Motorola’s feedback program. It’s not the Android 4.4 KITKAT many of you are likely craving, but this is still a significant face lift that should make many folks eager to get their hands on this upgrade. Be sure to hit Settings > About Phone and check for the firmware update right now. You’ll want to be on WiFi, of course, as this will be a sizable download. It also wouldn’t hurt to get your battery charged up to at least 30%. 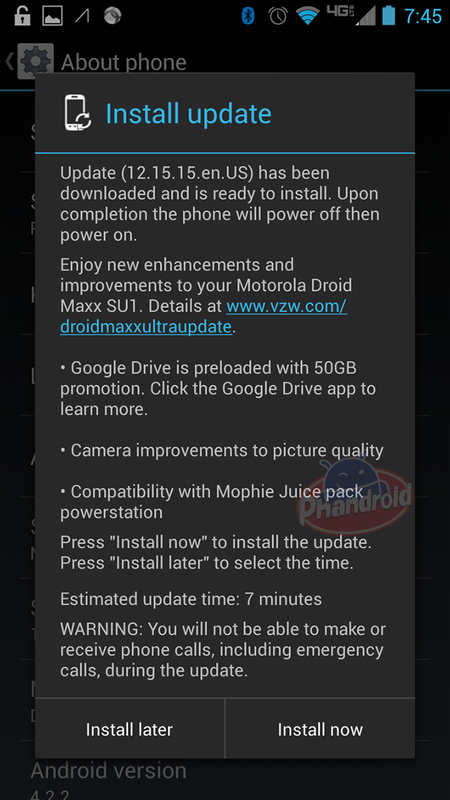 Oh, and don’t forget that some of Motorola’s older DROIDs on Verizon’s network have received minor OTA upgrades recently (as one gracious soul at AndroidForums kindly pointed out). We’re talking about the Motorola DROID RAZR HD and DROID RAZR MAXX HD. That should bring us improved HDMI connectivity, fixes for GPS indicator issues, the ability to charge via Rapid Charger while the device is off, and an updated version of Backup Assistant. The same deal goes for these phones as the latest DROIDs — WiFi, 30% battery, then head to Settings > About Phone. Hop to it!